This exotic blend of natural resins, aromatic herbs, spices and essential oils is combined in accordance to ancient wisdom, and blessed to create a sensual and attractive environment. Light half a teaspoon on a piece of charcoal in a fire-proof bowl made of clay or stone, and invite Kama Deva into your heart. Kama is sensual passion and pleasure. Kama Deva, the God of passion and love, stands with his bow ready to shoot arrows decorated with fragrant flowers into lucky hearts. Ramakrishnananda resin incense are unique blends of herbs, resins, oils and aromatic woods mixed together and infused with prayers and special mantras. 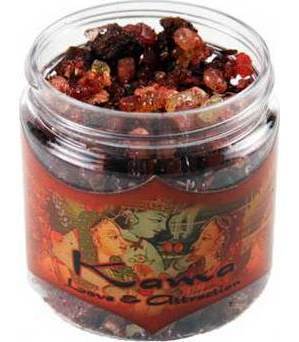 These resin incense are an exotic blends of frankincense, myrrh, copal, amber, pine, lavender, rosemary, orange peel, cinnamon, clove, sandalwood,clay and brown sugar mixed together with a variety of oils and secret mantras creating the perfect pure herbal resin Our authentic aromas are so powerful that half a tea spoon on a small charcoal will fill up your entire home or business with a mood transforming scent. For a complete purification ceremony use after smudging with "White" or "Dessert" Sage." Made in U.S.A.